Again, I'm struggling with the handwriting. I think this says that: Lan??? (an occupation?) ungk. (bachelor) Torjer Olsen [of] Prestegaarden og (and) pig (maiden) Anna Siursd[tr] [of] Grove [with sponsors] Godschalk Laren [of] Endere og [and] Knud Andersen [of] Broen. Was the engagement or betrothal or banns on 7 May? The marriage was 23 June 1796. Praestegaarden, Grove, Endeve and Broen are probably farms in Wangen (Voss) parish. Voss (Vangen) Parish Church (Voss, Norway), digital images, Arkivverket DigitalArkivet, Scanned Church Records (http://www.arkivverket.no/URN:kb_read), Voss: 1780-1810, Ministerialbok A9, Marriages, Page 153, Torgeir Olsen and Anna Sjursdtr, at Vangen (accessed 12 December 2013). 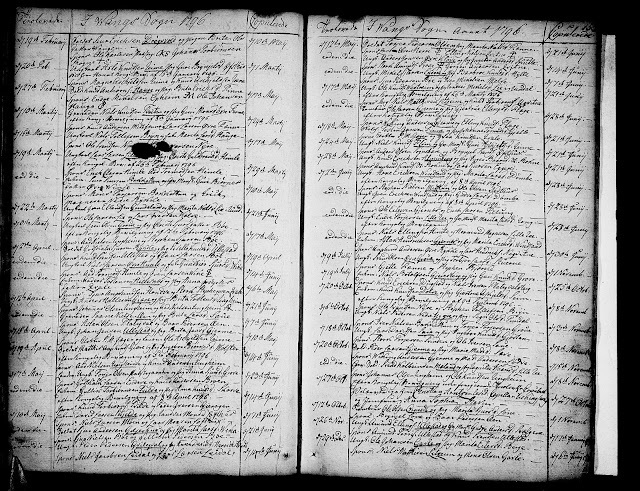 Anna Siursdtr (1772-1826) married Torjer Olsen (1753-1827) in 1796 in Voss, Norway, and they had six children born in Voss parish, including Sjur Torgersen (1804-1889). Anna and Torjer are the 2nd great-grandparents of my wife, Linda (Leland) Seaver. 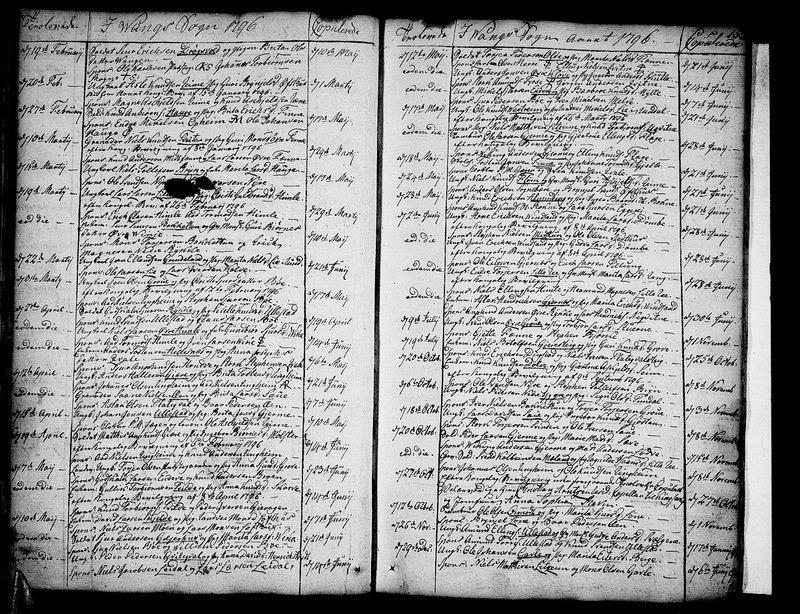 I captured these records and wrote about the process in Finding Norwegian Church Parish Records in DigitalArkivet Website (dated 12 December 2013). I also crafted some source citations then too - the process and result is in A Source Citation for Anna's Death Record in Voss, Norway (posted 13 December 2013). MyHeritage Announces the "Collection Catalog"